Mgr Newton and Bishop Philip Egan. 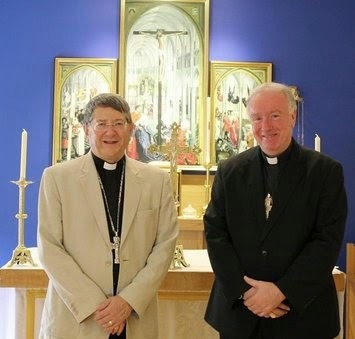 The Ordinary of the Personal Ordinariate of Our Lady of Walsingham, Monsignor Keith Newton, has preached to hundreds of Mass-goers in Portsmouth Cathedral, where he spent the weekend of 26/27 July, about the vision of Christian unity held out by the Ordinariate. He said that people sometimes asked members of the Ordinariate why they couldn't become "proper Catholics" . "What they mean", he said, is "why can't you just be absorbed into the wider Catholic Church so that what you bring disappears like sugar dissolved in water". The answer , Mgr Newton said, was that Christian unity was not about Christian uniformity; rather it was about exploring the possibility of sharing a common faith in communion with the successor of Peter and yet having different liturgical, devotional and pastoral practices which enriched the wider Church. This, he said, had "important ecumenical implications". The Ordinary spoke of the Ordinariate Use Mass, approved by Rome last year, which integrates elements of the Church of England Book of Common Prayer into the Roman rite. He said the Book of Common Prayer was one of the "treasures to be shared" with the Catholic Church. People in Portsmouth who were interested to find out more could go to an Ordinariate"exploration day "event being held by the local Portsmouth Ordinariate group at St Agatha's Church on 6 September where they could experience the Ordinariate Use Mass. The Portsmouth event is one of some 40 different events being held on 6 September by Ordinariate groups across the country aimed at helping people - especially those in the Church of England who may feel that God could be calling them into communion with Rome - to understand the Ordinariate better. Pope Francis has sent a message to the Ordinary in which the Holy Father sends good wishes and says he is praying for the success of the day. Mgr Newton's visit to Portsmouth was arranged as part of an appeal by the Friends of the Ordinariate, which was set up to assist the Ordinariate and support its work. By kind permission of Bishop Philip Egan of Portsmouth, the Ordinary celebrated three Masses and preached at all the Masses over the weekend. There was a retiring collection for the Friends of the Ordinariate. The Ordinary's homily included an appeal for prayers for the persecuted Catholic Christians of the Eastern Rite who are suffering in Iraq and elsewhere in the Middle East.